A little over a year ago my imagination was captured by the Geek Chic Fabric 8 contest for which I entered Intergalactic Scrapbook, a fabric design that extends the vintage linen, French travel postcard look to the vast galaxy of science fiction. I have been both humbled and thrilled by the number of fellow “creatives” who decided to use this design in their own projects. If you are among them, thank you! May you live long and prosper! Since then I have released over 150 different fabric designs, most of which can be ordered as wallpaper, decals, and gift wrap as well. I am just getting started! This year the Fabric 8 contest description reminded me of last year’s entry, but a new fresh design is required. Therefore, I am excited to present Intergalactic Chalkboard. I believe that this design is perfectly suited for Spoonsflower’s new Faux Suede fabric and I can’t wait to receive my order! The reason I am excited about this year’s design goes beyond the trendy chalkboard to the message written on it. Each person (whether they prefer to live on the planet or off of it) has a purpose and destiny to find and fulfill. So many aimlessly float in a blank empty space waiting for destiny to find them. To me, life is like a Cosmic Voyage of Discovery. True adventurers employ creativity, vision, and imagination, to discover secrets pertaining to their identities and destinies. That is why these chalk silhouettes of Starships, Spaceships and other adventurous vessels that could have flown through worlds like Star Trek, Star Wars, Firefly, Stargate, and Doctor Who spell out the words Voyage of Discovery, Creativity, Identity, Imagination, Vision, and Destiny with their flight paths as they fly through space on quests that at their core are not so dissimilar from our own. My hope is that everyone who sees this fabric will discover their personal “For What” and “For Whom” they are created to be. Because then the TRUE adventure begins! 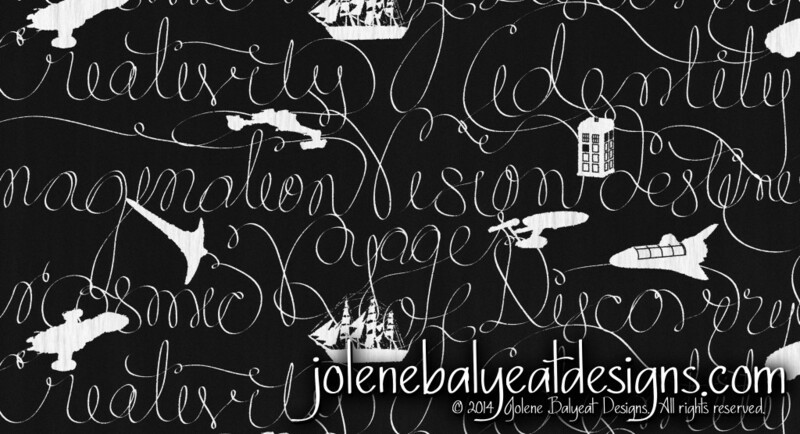 For those who can, please login or create a quick account on Spoonflower’s site so that you can “favorite” this design. It just may help Intergalactic Chalkboard make it into the top 100 designs. From all of the entries submitted, 100 designs will be chosen for the semifinal round of voting, which will be open to the public. The top eight designers will be asked to develop three more designs to round out their collections, and then the public will choose the winner from the eight collections. The winner receives a contract to design a small collection for a fabric manufacturer (Robert Kaufman). This is definitely on my bucket list! Plus the royalties would be a huge help to me as my 7 year old design software is in desperate need of an upgrade! There are so many designs still longing to escape my imagination to become a part of yours! Thank you all for your support! …For I know the plans I have for you,” declares the LORD, “plans to prosper you and not to harm you, plans to give you hope and a future. This entry was posted in Inspiration, Musings and tagged Cosmic Voyage, Fabric8, Intergalactic Chalkboard, Intergalactic Scrapbook by jolenebalyeat. Bookmark the permalink. I’m looking to make a secret santa gift for someone who is a huge fan of Doctor Who, Firefly, Star Trek and Star Wars, and I was very excited to find both the Intergalactic Scrapbook and Intergalactic Chalkboard fabrics – they’re perfect! – but the links to spoonflower flower don’t seem to be working. 🙁 I also tried searching for them on spoonflower, but nothing came up. Are these fabrics no longer available? Is there a way you can make them available again? A friend of mine had a purse made with the intergalactic scrapbook fabric the other day and I just fell in love! The chalkboard one is really great too! I really, I’ve never seen something quite like it, the combinations of geekery are really unique as most geeky fabric focuses on one particular section. I was wondering if there had been any progress and if either of these fabrics might be available somewhere? Thanks! Thank you so much for your kind words. Sadly the design is still no longer available.